The American marten or American pine marten  (Martes americana) is a North American member of the family Mustelidae, sometimes referred to as the pine marten. The name " pine marten" is derived from the common but distinct Eurasian species of Martes. It differs from the fisher (Pekania pennanti) in that it is smaller in size and lighter in colour. This article incorporates public domain material from the United States Department of Agriculture document "Martes americana". ^ a b Reid, F. & Helgen, K. (2008). "Martes americana". IUCN Red List of Threatened Species. Version 2009.2. International Union for Conservation of Nature. Retrieved 7 February 2010. ^ Stone, Katharine. (2010). 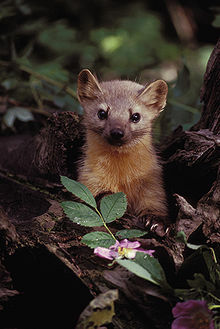 Martes americana, American marten. In: Fire Effects Information System. U.S. Department of Agriculture, Forest Service, Rocky Mountain Research Station, Fire Sciences Laboratory (Producer). Retrieved on 2018-11-11. ^ a b c d e f g h i j k l m n o p q r s t Buskirk, Steven W.; Ruggiero, Leonard F. (1994). 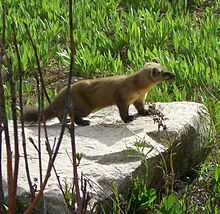 "American marten}, pp. 7–37 in Ruggiero, Leonard F.; Aubry, Keith B.; Buskirk, Steven W.; Lyon, L. Jack; Zielinski, William J., tech. eds. 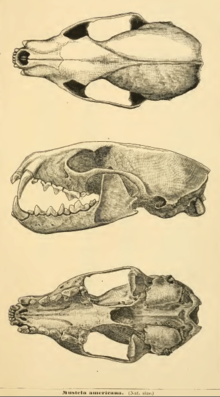 The scientific basis for conserving carnivores: American marten, fisher, lynx, and wolverine. Gen. Tech. Rep. RM-254. Fort Collins, CO: U.S. Department of Agriculture, Forest Service, Rocky Mountain Forest and Range Experiment Station. ^ a b c d e f g h i j Clark, Tim W.; Anderson, Elaine; Douglas, Carman; Strickland, Marjorie (1987). "Martes americana" (PDF). Mammalian Species. 289 (289): 1–8. doi: 10.2307/3503918. JSTOR 3503918. Archived from the original (PDF) on 4 March 2016. Retrieved 27 August 2012. ^ List of Vermont's Wild Mammals Archived 20 December 2007 at the Wayback Machine. (PDF) Retrieved on 2011-05-28. ^ List of Wild Mammals in Maine. (PDF) . Retrieved on 2011-05-28. ^ List of New Hampshire Wildlife Archived 3 September 2009 at the Wayback Machine. Wildlife.state.nh.us. Retrieved on 2011-05-28. ^ "Protections urged for Humboldt Martens". Curry Coastal Pilot. Retrieved 28 June 2018. ^ a b Godbout, Guillaume; Ouellet, Jean-Pierre (2008). "Habitat selection of American marten in a logged landscape at the southern fringe of the boreal forest" (PDF). Ecoscience. 15 (3): 332–342. doi: 10.2980/15-3-3091. ^ a b c d e Archibald, W. R.; Jessup, R. H. (1984). "Population dynamics of the pine marten (Martes americana) in the Yukon Territory", pp. 81–97 in Olson, Rod; Hastings, Ross; Geddes, Frank, eds. Northern ecology and resource management: Memorial essays honouring Don Gill. Edmonton, Alberta: The University of Alberta Press. ISBN 0888640471. ^ a b c Smith, Adam C; Schaefer, James A (2002). "Home-range size and habitat selection by American marten (Martes americana) in Labrador". Canadian Journal of Zoology. 80 (9): 1602–1609. doi: 10.1139/z02-166. ^ a b c Phillips, David M.; Harrison, Daniel J.; Payer, David C (1998). "Seasonal changes in home-range area and fidelity of martens". Journal of Mammalogy. 79 (1): 180–190. doi: 10.2307/1382853. JSTOR 1382853. ^ a b c Poole, Kim G.; Porter, Aswea D.; Vries, Andrew de; Maundrell, Chris; Grindal, Scott D.; St. Clair, Colleen Cassady (2004). "Suitability of a young deciduous-dominated forest for American marten and the effects of forest removal". Canadian Journal of Zoology. 82 (3): 423–435. doi: 10.1139/z04-006. ^ a b c d e f g h i j k l m n Strickland, Marjorie A.; Douglas, Carman W. (1987). 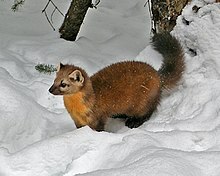 "Marten", pp. 531–546 in Novak, Milan; Baker, James A.; Obbard, Martyn E.; Malloch, Bruce, eds. Wild furbearer management and conservation in North America. North Bay, ON: Ontario Trappers Association. ISBN 0774393653. ^ a b c Bull, Evelyn L.; Heater, Thad W (2001). 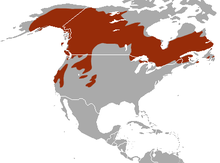 "Home range and dispersal of the American marten in northeastern Oregon". Northwestern Naturalist. 82 (1): 7–11. doi: 10.2307/3536641. JSTOR 3536641. ^ Hawley, Vernon D.; Newby, Fletcher E (1957). "Marten home ranges and population fluctuations". Journal of Mammalogy. 38 (2): 174–184. doi: 10.2307/1376307. JSTOR 1376307. ^ a b c d e Zielinski, William J.; Spencer, Wayne D.; Barrett, Reginald H (1983). "Relationship between food habits and activity patterns of pine martens". Journal of Mammalogy. 64 (3): 387–396. doi: 10.2307/1380351. JSTOR 1380351. ^ Krohn, W B; Elowe, K D; Boone, R B (1995). "Relations among fishers, snow, and martens: development and evaluation of two hypotheses". Forestry Chronicle. 71 (1): 97–105. doi: 10.5558/tfc71097-1. ^ a b Koehler, Gary M.; Hornocker, Maurice G (1977). "Fire effects on marten habitat in the Selway-Bitterroot Wilderness". Journal of Wildlife Management. 41 (3): 500–505. doi: 10.2307/3800522. JSTOR 3800522. ^ a b c Bull, Evelyn L.; Heater, Thad W (2001). "Survival, causes of mortality, and reproduction in the American marten in northeastern Oregon" (PDF). Northwestern Naturalist. 82 (1): 1–6. doi: 10.2307/3536640. JSTOR 3536640. ^ a b Fredrickson, Richard John. (1990). The effects of disease, prey fluctuation, and clear cutting on American marten in Newfoundland. Logan, UT: Utah State University. Thesis. Wikimedia Commons has media related to Martes americana.